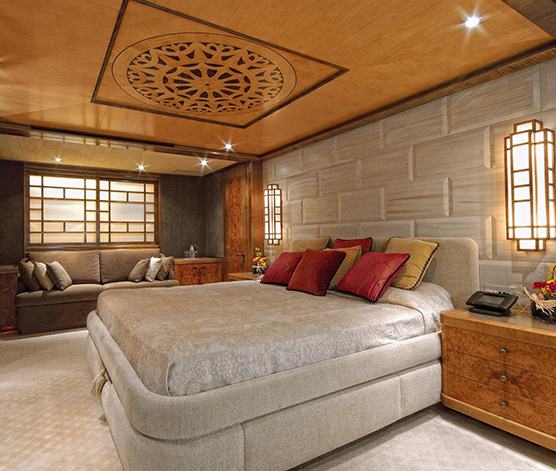 Motor yacht POLLUX has a full beam master suite, featuring natural colours welcomes you with a feeling of space. 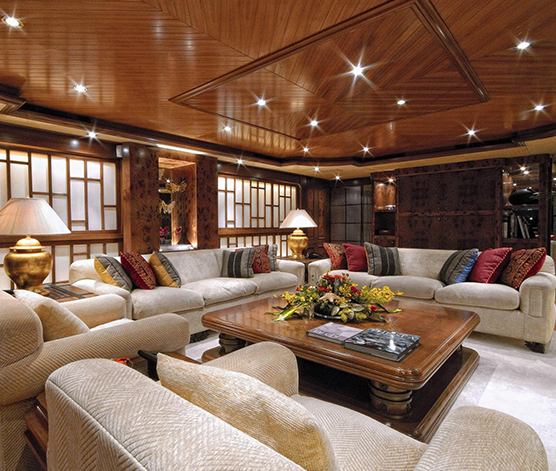 The VIP suite offers a double bed, fully upholstered in leather which matches the burl wood of the furniture and the cream tones of the carpet. 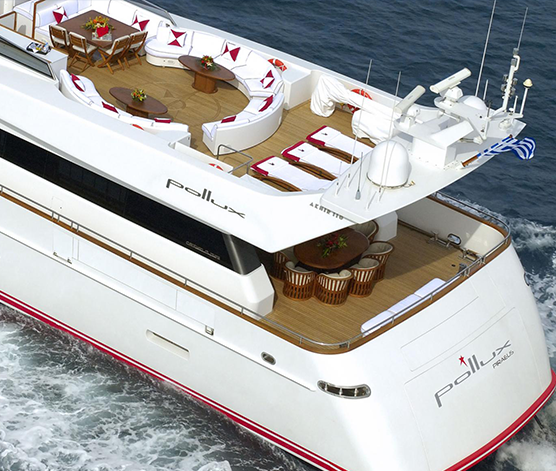 On the lower deck, there are the two spacious twin cabins both with ensuite facilities. The extensive use of onyx marble together with the combination of silver and gold plated trimmings in the guest bathrooms provides a refined elegance and richness to the interior design. 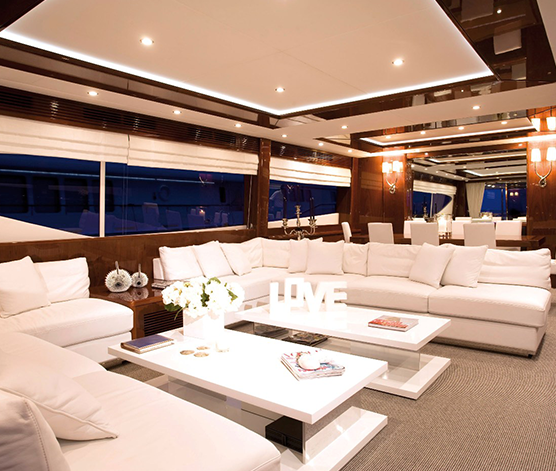 M/Y POLLUX’s fly bridge offers ample space a dining table a full beam circular lounging area and sun beds. Entertainment is provided through her centralized Linn system. 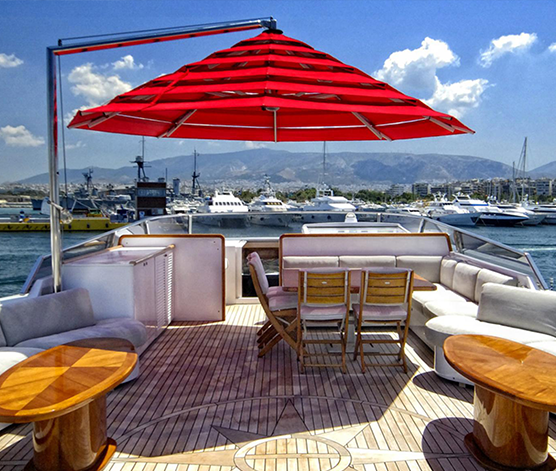 Motor yacht POLLUX (ex PARAGON) has a great charter reputation and an eager crew of 6 ready to welcome you onboard to cruise the beautiful Eastern Med. M/Y POLLUX underwent a full refit in 2008 including replacement of all carpets, replacement of decorative pillows in salon and all cabins, leather cover on dining chairs, Replacement of artwork, All linen, cutlery, glassware, dishware are new, new laundry and galley equipment, a New Plotter on fly bridge and wheelhouse, ; New Plotter in wheelhouse, a new BBQ on fly bridge, Tenders, jet ski, toys brand new, new covers for pillows on sundeck, new sun beds / chairs on sundeck, new fenders, new generators and bow thrusters, an Upgrade to Creston panels (adjustment of sound, lights etc) and individual panel to each cabin and saloon.